There is only one of these in the world. For unique and rare supercar lovers this is one of those "you may never, ever see this in real life" moments. DLMphotos got a chance to shoot some video of programmer David Heinemeier Hansson driving his Koenigsegg Agera HH. 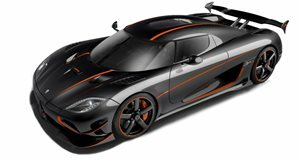 The HH is based on an Agera S technical spec, with Aircore hollow carbon-fiber wheels, upgraded power and enhanced aerodynamics. The Agera S is powered by an in-house developed 1030-hp 5.0-litre twin-turbo V8, with a top speed of 272 mph. It is a ridiculous car and apparently one of many owned by the wealthy car collector. Among others in his collection is a Pagani Zonda. Jealous?